Anu Bajaj, Director of Gallery Art Positive is bringing five internationally renowned sculptors together from different parts of the country for the show "In the Round" curated by Anupa Mehta. The art show which is set to coincide with the Lado Sarai night, will showcase art works of Jagannath Panda, Karl Antao, GR Iranna, Arun Kumar and Ravinder Reddy. The exhibition which is set to begin from February 10 will present king size sculptures by these artists. While lauded artist Jagannath Panda will present illustrious sculptures that are significant of India’s burgeoning development, Karl Antao will showcase life-sized wooden sculptures chiseled with beautiful cravings. 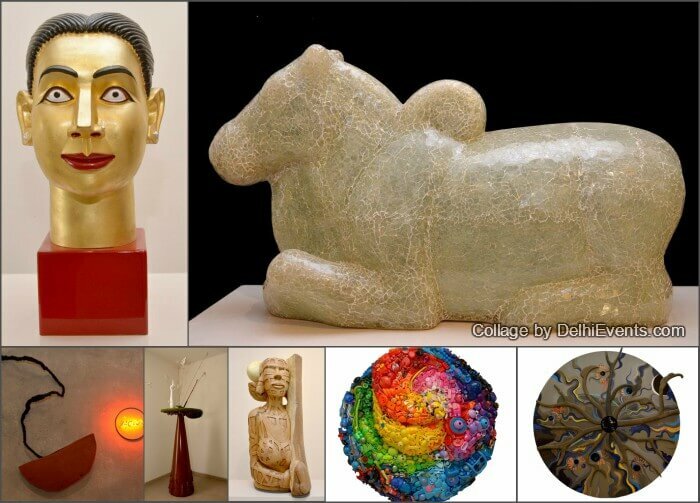 Eminent Sculptor Arun Kumar’s toy-like, yet intricate sculptural works will be showcased beside Ravinder Reddy and GR Iranna’s remarkable sculptures that tends to dissect human nature while leading the viewer to act on all of his senses. Through different materials, mediums, colors, forms, size and textures, the artists have expressed their interest in the traditional sensibilities, human emotions, and the context of urbanization that delves into unreal world among others. For instance Odisha-based, Jagannath Panda has dabbled in diverse forms of art and is one of the few artists of his generation who has been able to work with religious imagery, without succumbing to the powerful trap of kitsch. For the show, the artist has created a compilation of animal sculptures that focuses on the deeper issues of the natural and the manmade collide in an urbanized world. “These sculptures is touching upon the deeper meaning of unavailability of space for animals to find shelter with the rapid urbanization which has converted our forests into concrete jungles. The works are a mix of mythology with reality, and motifs from traditional Indian art with images from Western and Indian contemporary culture, to explore the effects of globalization and rapid development on our country,” says Jagannath Panda. Ravinder Reddy who belongs to Andhra Pradesh is known or his contribution to contemporary South Asian Art worldwide. Reddy’s monumental female heads and nudes that will be showcased in the show suggests a multifaceted femininity which is rooted in the past but also embraces the beauty of the contemporary world. The artist tends to fuse the pop and folk sensibilities with the traditions of Hindu sculptures through his life-sized sculptures. Whereas for Karnataka born Arun Kumar HG humblest of the things- toys, plastic, ceramics, cow dung, hay and TV monitors contributes to his artistic imagination. Kumar manipulates these readymade objects in varied contextual settings that provides a glimpse of his susceptibility towards the neo-pop movement. “This eclectic approach allows us to articulate the ideas through remarkable, layered meanings,” says Arun Kumar. Coming from a farming background, GR Iranna's exposure to both- the urban and rural worlds has deeply influenced his artwork. The artist who has received national and international recognition throughout his career, will be showcasing sculptures that make the viewer visualize the cycle of violence through the metaphors like hooded nudes, donkeys and chhapals. After experimenting with advertising, corporate filmmaking and trophy designing, Mumbai-based, Karl Antao began his love affair with sculptures after he paid a visit to his father in Ahemdabad. The artist who has eight solo exhibitions to his credit will be showcasing mammoth creations made from the material wood that gives the sense of myriad human emotions. “Through this exhibition we are presenting a newer way of seeing. The selected artists have worked in different mediums and created new forms and textures which give the unprecedented experience of moving around the work of art,” says Anu Bajaj, Director of Gallery Art Positive.